* The online presale period for this show has ended. All remaining tickets will be sold at the door. Aaron Johnston, drummer of Brazilian Girls, is taking his J.E.D.I. (Jazz Electronic Dance Improvised) project on the road this Spring. The project has seen a rotating cast of musicians such as Michael Kang (The String Cheese Incident), Borahm Lee (Pretty Lights / Break Science), Dominic Lalli (Big Gigantic), Ryan Zoidis (Lettuce), Eddie Roberts (The New Mastersounds), Nate Edgar (The Nth Power), and more join the accomplished musician over the course of the past two years, since J.E.D.I. made its initial debut. 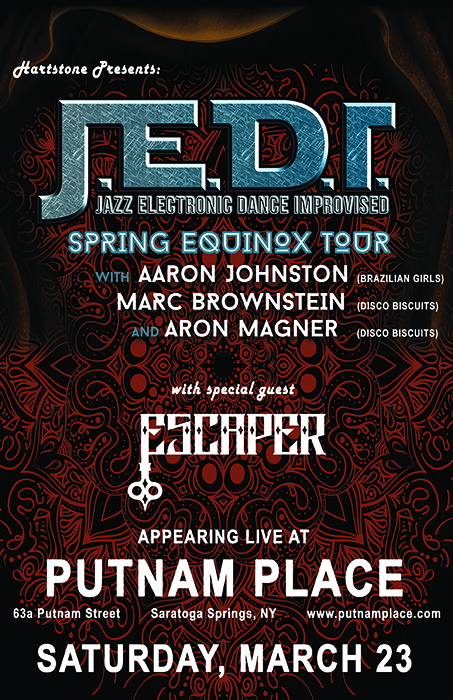 For the upcoming Spring Equinox Tour, both bassist Marc Brownstein and keyboardist Aron Magner of The Disco Biscuits will join Johnston on the four night run. The trio recently got together for a late-night throwdown post-Biscuits in Albany this past November, and have decided hit the road for a 4-night run. The group will blend a myriad of musical elements from a diverse range of genres including jazz, afrobeat, dub, funk, dance and more to create a “live music abstraction” each night of the tour. The literal definition of Escaper is “one who escapes confinement”. 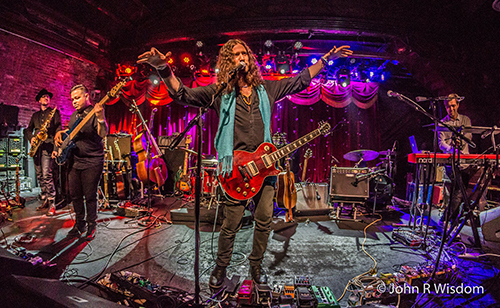 Named “On the Verge” by Relix Magazine, this Brooklyn based space rock band strive for a sound without limits while keeping the dance party going. They have shared bills with Jon Fishman (Phish), Karl Denson, Aqueous, Electric Beethoven, Strange Machines, The DAB Sessions feat Aron Magner and The Ghost of Paul Revere to name a few and have been seen this Summer at festivals such as Disc Jam (joined by members of Turkuaz), Grateful for Spring (as a headliner, joined by members of Cabinet), Elements:Lakewood, Bear’s Picnic, Mazzstock and more. Prior to joining Escaper, members of the band came from various other groups including Sister Sparrow & the Dirty Birds and The Funk Ark.